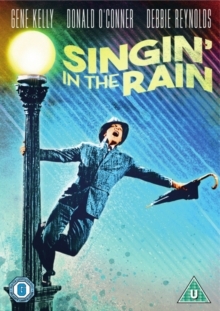 Classic musical comedy starring Gene Kelly, Donald O'Connor and Debbie Reynolds. In 1927, Don Lockwood (Kelly, who co-directs) has worked his way up from being a song-and-dance man with partner Cosmo Brown (Donald O'Connor) to become a top movie star. His on-screen partner, Lina Lamont (Jean Hagen), who believes that Don loves her for real, needs to have her awful voice dubbed with the arrival of talkies. The girl selected is 'serious' actress Kathy Selden (Debbie Reynolds), for whom Don soon falls. Musical numbers include the famous title song and 'Make 'Em Laugh', 'Good Morning' and 'You Were Meant for Me'.